The old saying “For every PhD, there is an equal and opposite PhD” highlights how some people try to get attention by being different (implying they are better than the rest). Many consultants criticise existing ideas to show they “have a new and improved way” and in doing so suggest the known things are now useless. This is of course rarely true. Often THEIR new thing is merely “rebranding” or slightly adapting something existing and claiming as their own. 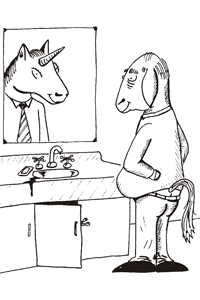 Such behaviour is displayed by the Unicorn… the Zoo character that THINKS they are perfect, but are just oblivious to their own limitations. A recent blog post from a consultant made the revelation that design thinking is “awesome but not enough” (which itself is a modification of “borrowed” unacknowledged phrase from Edward de Bono: “Excellent But Not Enough”). This should not be a surprise to any experienced professional. We all know in reality is NO one thing is enough. The “silver bullet” does not exist as any workable solution needs to be considered in context of the interdependencies and risks. What works here may not work there, or may need to be adapted to do so. Leadership by oversimplified recipe is self-limiting and shallow. Businesses and relationships are complex interdependent interactions that require a great deal of insight, judgement and leadership to sustain success. Professional and organisational development works better when we are open enough to challenge existing ideas and listen to alternative opinions, rather than simply adopt them or reject them. Equally, outright rejection of existing processes that are creating value (thereby suggesting yours is so much better), is poor form… and often a self-inflating exaggeration. Engaging new ideas WITH what we already have, more often enables us to evolve into more capable people and organisations. We cannot assume the status quo paradigm of this OR that, we should approach the more paradoxical challenge of prioritising this AND that (even when they seem like opposites). Genuine performance is like a good diet and lifestyle – it benefits from balancing of competing challenges. Good leadership strategy is watching and listening and making quality decisions that engage people based on knowledge, experience, evidence and common sense. Such is the magic of modern business! Arthur is collaborative leader who engages stakeholders to achieve mutually beneficial outcomes. His professional success record spans over 30 years of experience across the international corporate, government and tertiary education sectors. Internationally recognised as a knowledge and capability development thought leader, equipped with a diversity of skills and achievements including being the author of two books, a regular international conference speaker, award winning tertiary teacher and a volunteer student mentor and career advisor. Creator and leader of the Organizational Zoo Ambassador Network, an international association of professionals interested in sharing and innovative application of metaphor based behavioural learning and development to improve personal and team outcomes and build relationships. Reflecting on behaviour for team success | The Organizational Zoo on Is your culture fruit salad or amorphous fruit pulp?